I’m hard-pressed to think of an episode title that better evokes the feeling of watching the episode than “Are We There Yet?” That sentiment captures the episode perfectly; the impatience of seeing nothing but wide, flat land in front of you and just the same behind you, with no sense of where you are in relation to the journey’s beginning or its end. This final season of Dexter may actually be worse than riding shotgun on an interminable road trip though, because when you’re a kid, at least the frustration comes from knowing your parents know exactly how long it’s going to be until the destination but refuse to tell you. If this season were a road trip and I were in the passenger seat, I wouldn’t dare ask “Are we there yet,” because I’d be afraid to find out the driver was as clueless as I am. Sadly, there was a line of dialogue in “Are We There Yet?” that bested the title in describing the experience of watching this season of Dexter. It was spoken by Dr. Vogel, during her serial-killers-only dinner party: “I’ve always maintained that the greatest obstacle in life is not danger; it’s boredom.” Preach, sister. Because boredom has indeed become the greatest obstacle to Dexter’s audience at this point, as the final season has failed to even produce the self-parodic silliness of season six, let alone reach the heights of earlier seasons. It’s not just that this season isn’t good; it’s that it’s so, so, so boring. I’m having trouble determining which of these plots I care about the least, and the last thing I expected to feel about Dexter this far into its farewell season is complete ambivalence. Let’s go back to the basic story questions at this point: What is Dexter Morgan’s overarching goal? Why is it important to him to achieve that goal? Who or what stands to prevent him from achieving it? How will he change as a result of achieving or not achieving that goal? All those questions are built on the bedrock of Dexter’s desire to do… something. Sure, the macro-desire is always for Dexter to be able to kill people with reckless abandon and never be caught. But this is not really a character goal; it’s the essential premise of the show. There’s absolutely nothing new for Dexter to want, to pursue, to long for, to protect, to provide. He’s just not really doing anything. 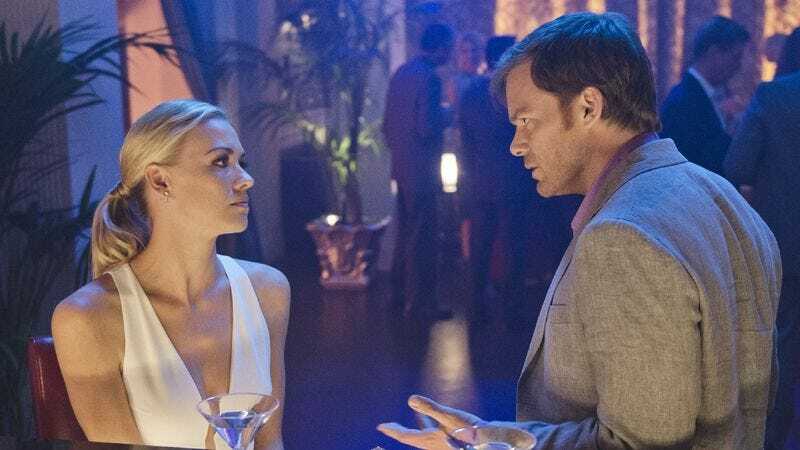 Sure, Dexter wants Hannah McKay back in his life, badly enough that he tracked her down in last week’s episode after being sedated and left on the side of the road, in what is perhaps history’s weirdest cry for help. But man, it sure is risky for the writers to hang so much weight on Hannah, a character we met last season, who vanished shortly after attempting to kill Debra, who is easily the show’s most likeable character at this juncture. Is this what the audience is supposed to rooting for? For Dexter and Hannah to live happily ever after? I’m assuming so, because “Are We There Yet?” chose to end on that note, with Dexter pleading with his tow-headed femme fatale to stay in the city in which she’s most likely to be apprehended and jailed. Never mind the fact that Dexter found Zach dead with a generous wedge of his cranium missing inside Dexter’s apartment. No, what was most important then was convincing Hannah to stay in Miami to risk doing the one thing Dexter most studiously avoids: getting caught. Added to this, if the goal was to keep Hannah out of harm’s way by freeing her from that mean ol’ husband of hers, how exactly is it beneficial for Hannah to remain in Miami now that it has been confirmed that there is a serial killer on the loose, one who has now killed two victims at Dexter’s apartment building? Speaking of sexual tension, or the lack thereof, remember when Debra and Elway were slowly closing in on each other? Well, apparently not anymore, and now they are just co-workers trying to track down Hannah to bring in a precious bounty. And when Debra manages to do just that, tracking Hannah to the Florida Keys using the GPS tracker she installed on Dexter’s car, she fails to make a citizen’s arrest because Hannah makes the case that she would rat both Dexter and Debra out if she was apprehended that way. And besides, arresting her would mean depriving Dexter of something he holds valuable, and certainly that should never happen on this show. I could continue climbing down into this logical morass, but I simply don’t want to. I don’t want to know how far down it goes. But there are only four episodes of Dexter remaining, and this makes the second in a row in which the most pivotal scene is the death of a character the audience barely knows. And the path forward seems… unfortunate. The episode’s titular question may not go far enough. At this point I’m wondering if there’s even a “there” to get to. Obviously there’s no point pulling at this thread, but I’m curious as to the point at which someone at Miami Metro might start to think something fishy is up with Dexter. Y’know, with Rita being murdered, and LaGuerta being murdered after trying to out him, and now his next-door neighbor being murdered. Part of me wants Dexter to continue indefinitely, so I could see at what point someone finally said “Y’know, guys, I think Dexter might be a serial killer.” Surely by season 23, it would come up. The voiceover and Ghost Harry stuff was especially awful this week, which is a profound statement. Dexter and Hannah were listening to João Gilberto during their drive to the Keys. I love João myself, but that’s what Dexter and Hannah would listen to during a drive? If God is in the details, this show is a nationally-televised Black Mass. Oh, and totally read this. It’s funny. 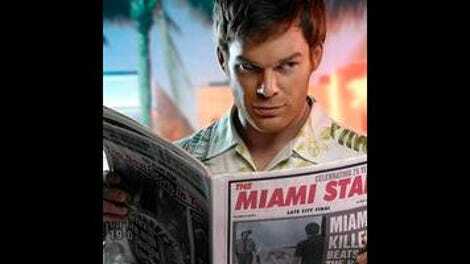 It makes the case for why Dexter is still good, essentially based on two points: 1.) Other shows that have been around for a long time are also bad, and 2.) It has the same characters now that it had in the beginning.